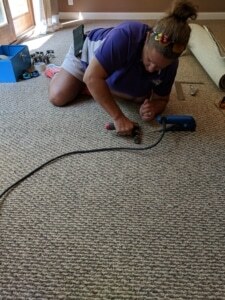 Our professionals at the Carpet Chemist are trained and certified Berber carpet repair experts. When you have a Berber carpet snag in Louisville, KY trust your carpets to our qualified team to restore your carpets to like new. We will hand weave the yarn so it seamlessly blends to like new condition. Patterned Berber carpet can also be brought back to like new condition if you have a leftover carpet remnant we can use as the donor piece, to match the pattern accordingly, and make a seamless repair. Trained and certified, and equipped with the proper carpet repair tools, the Carpet Chemist will beautifully restore your damaged carpet to make it look like it never even happened. We love it when our customers tell us they can’t even see where the damaged carpet was! Berber carpet snags can happen when pets get their little claws stuck in a loop in the carpet pile. Berber is an extremely popular loop pile carpet that people have in their homes and offices, and we repair these kinds of carpet imperfections every single day. Most of the time the pet’s claw will get caught in the loop and pull it up out of the carpet backing. When mom vacuums the room, she doesn’t see the pulled loop, and the beater bar in the vacuum cleaner grabs hold of it and creates a much worse snag. The best thing you can do is clip the snag off with a pair of scissors and discard it. You don’t want it getting any bigger or worse than it already is. Then, call The Carpet Chemist! We will put on our lab coats and jump in our fancy Carpet Cars with our toolboxes and other super nerdy carpet repair stuff and get your carpets fixed right up! STEP 2. UPLOAD pic of damaged carpet to the UPLOAD ATTACHMENT below.